Close of up the Louisiana Purchase Bas Relief. Dimensions: 57 inches in height, 46 inches in width, and 33 inches in depth. 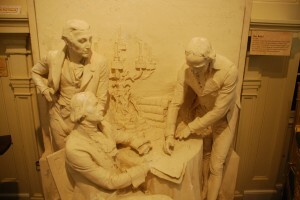 Description: This plaster bas relief created by Karl Bitter depicts James Monroe, Robert Livingston, and Francis Barbe-Marbois signing the Louisiana Purchase Treaty. 3-D Scanning Process: This object was scanned using the Skanect software, which proved difficult due to the space restrictions in the museum. The speed of the scan also had to be much slower than other scans taken with the Kinect due to the level of detail in the Bas Relief. For the complete collection of scans of the Bas Relief of the Signing of the Louisiana Purchase, click here. Exhibit: To view this object in context, click here.